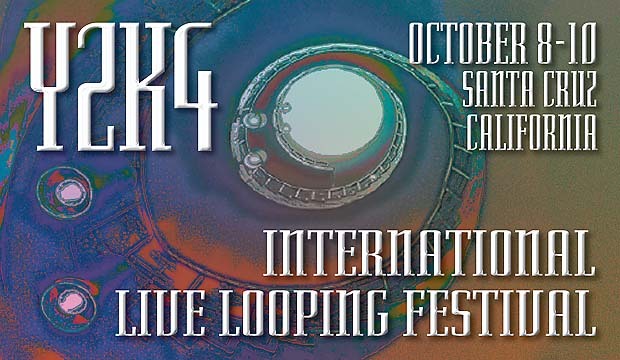 On October 7th, 8th, 9th, 10th and 11th 50 live looping artists from several countries and all around the US performed at the largest event of its kind in history: the Y2K4 INTERNATIONAL LIVE LOOPING FESTIVAL in San Francisco and Santa Cruz, California. ETHERIC NETWORKS of Santa Cruz provided the internet connection to simulcast the entire two day main festival. Featuring artists from as far away as Japan (Sunao Inami, Japan's most prominent live looper), Switzerland (promising newcomer, guitarist Bernhard Wagner), and Iceland (sound artist and instrument builder Kitundu) the festival featured the creme de la creme of this burgeoning international musical movement (there were 20 live looping festivals in 11 countries in the last 12 months and Looper's Delight (www.loopersdelight.com), the mecca website of the movement averages about 900'000 page views per month). There were also several proprietary live looping technologies that had their debut at this year's festival. The live looping movement has no musical style or genre that defines it. Indeed, there were performances by solo guitarists, percussionists, multi-reed and brass musicians, vocalists, circuit bending artists, found sound artists, as well as avante garde electronic musicians. It is defined by the technology that allows the musicians to digitally clone themselves while playing live in front of an audience. Along with headliner Sunao Inami (Kobe, Japan), the festival presented featured performers Michael Klobuchar (guitarist from Pittsburgh, Pennsylvania), Bernhard Wagner (guitarist from Zurich, Switzerland), Ted Killian (guitarist from Medford, Oregon), and Kid Beyond (beat boxer from San Francisco, California), Kitundu (sound artist and instrument builder from Iceland). The main festival occured on Saturday and Sunday the 9th and 10th in Santa Cruz where all 50 loopers performed on two stages with continuous music from noon to midnight but kicked off in Santa Cruz with a free concert on Friday night, October 8th with individual concert performances by Sunao Inami, Bernhard Wagner and Michael Klobuchar. The night before, the Inami/Walker/Wagner International Looping Trio (with festival organizer Rick Walker on found sound, percussion and electronics) performed at the prestigious new music venue, Luggage Store in San Francisco. Rick says, "We have had really great festivals in the last few years here in Santa Cruz, but this event tops them all in its scope and the sheer number of musicians who played at it. It was wonderful to have the eyes of the whole international looping community on us for this weekend. Headliner Sunao Inami and featured artist Bernhard Wagner were on air Oct. 9th 2004 at KZSC Radio 88.1FM, Santa Cruz discussing electronic music, live looping and the Y2K4 Live Looping Festival. (pictures). There's a review of the festival by Cat Hebel of Santa Cruz Live. Concert featuring 8:00 Michael Klobuchar (USA), 9:00 Bernhard Wagner (Switzerland), 10:00 Sunao Inami (Japan) October 8th, 8:00 pm QUESTION MARK GALLERY (in the Pearl Alley Bistro building), 1101 Pacific Ave., near Cathcart Street, across from the China Szechwan Restaurant in the new University Building, in the back facing the parking lot. (mapquest, yahoo map) pictures by Bernhard Wagner Free admission to the public, all ages welcome! Festival: 50 live looping artists performed 30 minute sets on two stages without interruption. October 9th-10th, noon to midnight RESONANT CHURCH, 429 Pennsylvania ¼ block south of Soquel Avenue (mapquest, yahoo map) pictures of 9th and 10th by Sunao Inami, pictures of 10th by Bernhard Wagner $10 USD for each day with no one turned away for lack of funds. Annual Looper's Brunch October 11th, 1:00 pm THE CATALYST, 1011 Pacific Avenue (mapquest, yahoo map) Free except for price of brunch. Hint: Click on the table's column headers to sort the entries by that criterion. For more information or to set up interviews with any of the visiting artists or the organizer please write Rick Walker at or call +1 831-425-8659. Poster/T-shirt photography: Andrew Kaiser, www.absoluterealitystudios.com (for "The Spiral"). All the artists who have donated all of their time and who have all travelled to perform at their own expense. The Y2K4 Loop Festival wants to especially thank the kindness and generosity of Neil DiScala who graciously donated the use of the Resonant Church for the main festival. We couldn't have done this wonderful event without you, Neil. Loopers Delight, founded and maintained by Kim Flint. time and financial contribution to this community. See you all there, I hope!!! !